I have long wanted to do a Q&A session called Tiffinbox 20/20 with artists from or working in South Asia. A couple of weeks back I ran into (virtually, that is) Krishna M. Sadashivam, the creator of PC Weenies, techno-centric comic strip and asked if he would be interested in participating in my little project. I sent him some 21 questions and here are his answers. Seshu: Tell us how you got your start in cartooning? Krishna: I've always been drawing cartoons in some form or fashion since I was a small child. My earliest sequential comic strip work began when I was in the 6th grade and I've carried it forward ever since. Seshu: Who are your early influences? Whose work do you follow now? Krishna: My early influences would have to be the Warner Bros. cartoons, specifically the Road Runner ones by Chuck Jones. I must have seen those cartoons a million times as a child. As I got older, I began to broaden my horizons towards super-hero comics, which has a lasting influence to this day. These days, thanks to the Internet, I follow several artists. Among my favorites are Mike Krahulik (Penny Arcade), Stephen Silver, Ben Caldwell, Bruce Timm and Kevin Dart. Seshu: What tools do you use to create your art? Krishna: I use a Pentel 0.5mm mechanical pencil and 50lb sketch paper for all my concept work. It's still the fastest way for me to visualize my ideas. I take these sketches into a Power Mac G5 and use a combination of Corel Painter and Photoshop to ink, color, and caption each cartoon. Seshu: Do you consider your word “Art,” with a capital A? Krishna: Art is art is art. Whether it's a Picasso or a doodle on the side of a notebook, to me it's the process of visually projecting one's ideas across – and that's all that counts. Seshu: Take us through your process in creating your work. Krishna: The hardest part of cartooning, for me, is coming up with new ideas. I spend a good deal of time doing research, using the web, magazines, and popular culture as my references. Once I have a general theme for a cartoon, I begin sketching. People are often surprised to learn that I usually come up with the sketch before I finalize a caption. After creating a rough sketch, I scan the line art into the computer, and digitally ink the drawing using Corel Painter. I save the file out and proceed to color and caption the cartoon in Adobe Photoshop. I try to work ahead – I generally have a week's worth of comics as a buffer, to be on the safe side. Seshu: How did PC Weenies get it start? Krishna: I'd like to think that the idea was carefully constructed after several years of field study as an engineer, but truth be told, the idea came to me while I was taking a shower one fine October in 1998. (The shower is the place where I get most of my ideas, even to this day.) Webcomics, as such, were few and far between. I was eager to share my work online, and so I procured hosting and placed my first cartoon on the web, not thinking too much about it. I received a piece of fan e-mail shortly after placing the first two toons online, and suddenly I realized I had an actual audience, even though at the time it was only one other person. Seshu: Are your cartoons a reflection of something that you overheard or experienced first hand? How do you deliver your content in a consistent manner? Krishna: Usually, my cartoons are an extension of what I have experienced first-hand. Occasionally, people will send their ideas along for me to encapsulate into a toon. More often than not, however, most of my ideas come from my own warped sense of humor. If I find it funny, I make a toon about it, and hope that others will find it amusing as well. For many years, I only delivered two toons a week – however, within the last few years I have gotten more comfortable with producing 3 strips each week. The key to consistency for me is having a constant flow of ideas to work from. And that's why I'm on the Internet all the time. Seshu: How did you go about branding yourself, PC Weenies? How did you place your thumbprint on your work? Krishna: I don't exactly remember how I arrived at “PC Weenies” as a term, but it had something to do with me being the lone Mac user in my place of work. Back in those dark days, Mac users were universally shunned and made fun of. This was my way of sticking it back to the PC folks back then. Of course, now that there's more of a parity between Macs and PCs, the toon has evolved to represent any type of computer weenie. Seshu: As a teacher, have you been tempted to conduct a workshop in editorial cartooning? 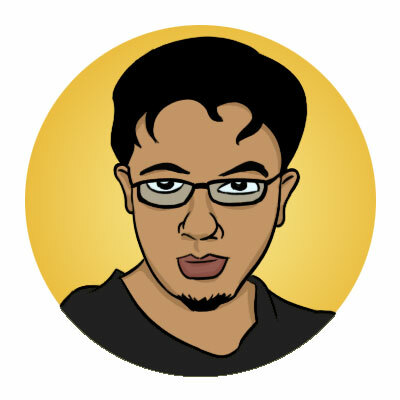 Krishna: I'm not much of an editorial cartoonist – but I do offer workshops to students who are interested in learning the technicalities behind creating webcomics. Seshu: Other illustrators have published books – are you gaming to do the same at some point in the future? Krishna: Creating and publishing a PC Weenies book is one of my foremost goals. I'm currently in the process of reworking my older toons (providing brand new art, etc.) and compiling the best of the toons from 1998 – 1999 into a Greatest Hits volume, with some never before seen goodies. I'm targeting November of this year as my ETA, but it may slip back until Spring of 2008. Seshu: What does the M. in your middle initial stand for? Krishna: Madurai – it's my dad's first name, and it represents the place he grew up in India. Seshu: How do you balance work and life? What do you do so that you don't burn out? Krishna: It's not easy. I try to properly plan my weekly schedule in such a way that affords me the time to create new ‘toons. That weekly schedule fluctuates, depending upon my academic responsibilities. Exercising and going outside (anything away from technology) tends to provide the necessary rejuvination I need. Seshu: Following that – how do you handle the pressure to create something fresh or new? Krishna: That pressure is always there – but I always come back to my main focus – to create comics that I would love to read myself. As long as I am enjoying the journey, I will continue to produce more. The minute it becomes too much like work or routine, is when I know I need to take a break from it. Seshu: Criticism – positive or negative – how do you respond to it? Krishna: I seek out all types of criticism, be it positive or negative. One of the things we teach our students is that critiques are part of what being a designer is all about. I've had some scathing reviews in the past (both regarding content and art) and I've taken each to heart and tried to improve. 95% of the time, I rarely receive any type of feedback. Of that percentage, the feedback that makes it into my InBox is usually very positive and encouraging. Seshu: Syndication – Is your comic strip distributed? How does one get one's work out there? Krishna: I'm self-syndicated and I think that's the best way for me to continue to proceed. That's not to say that if I receive a generous offer from a syndicate, I would refuse them. I try to keep an open mind and welcome new opportunities. With the web, there is a very low entry point to become self-syndicated, which is what I tend to embrace. The best way to get one's work out there is to produce consistent work on a regular basis. Mingle on forums that are related to the subject / niche your comic addresses. And don't be afraid to occasionally advertise! Seshu: Is there one character you associate with more personally than others? Which one? Krishna: I find myself associating heavily with Bob Weiner, my principle protagonist. Although I'm tall, not balding, and only half as chubby. Seshu: To those interested in cartooning for publication – what should they work on? Krishna: Consistency is very important to succeed as a published cartoonist. Regardless of your style, being able to deliver cartoons on regular basis, for years, is really the true test. Many folks give up after realizing how much work it requires to produce high caliber work consistently, day in and day out. Given the low entry point to publish one's work online – my recommendation would be to set up a website and publish online. Find a niche that you enjoy – be original – and follow your heart. Don't create a comic with the sole idea of being ‘successful'. It can take many years before your hard work and efforts begin to pay off. Be persistent! Seshu: Is there the possibility that you will animate your cartoons? Krishna: Definitely! Over my holiday break, I've been brainstorming ideas for a forthcoming animated PC Weenies short. Seshu: How do you address controversy in your cartoons? Seshu: Typically how long does it take you to create one comic strip? How many times do you revise it? Krishna: From idea inception to final toon, it takes generally 3 hours. I may go through two or three sketches before I decide on the final layout to go with. There may be many caption revisions, depending upon the ‘toon. 5 – 10 caption revisions are not too unusual for me. Seshu: One of my favorite comic strips is “What The Duck“. It's directed towards photographers and as one, I get a good laugh most of the time. Do you find that PC Weenies has a niche all its own and that the humor may bypass those not in that industry? Are you comfortable in that niche? Krishna: The niche that I am trying to capture with the PC Weenies would be comprised of scientists, engineers, mathematicians, developers, and tech enthusiasts. That being said, I'm sure there is a sizeable percentage of my audience who are not involved in these fields that come back week after week. 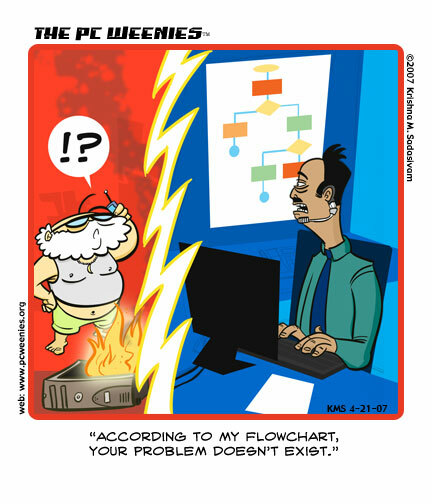 If a toon is too “techie”, I try to offer an explanation of the terms in the accompanying blog to help facilitate the humor. Most of the time, I try to keep things relatively straight-forward so that newbies and techies alike can enjoy the ‘toon. Excellent interview! PC Weenies ROCK!